The first wing created for the American defender of the America’s Cup was rolled out of Core Builders Composites, New Zealand, today ready for shipping to the USA.At 40 meters (131 feet) tall, the hi-tech carbon-fiber wing is the equivalent height of a 12-storey building and will power the AC72 catamaran used in the 2013 America’s Cup in San Francisco. The rules for the 2013 America’s Cup require the hulls to be built in a team’s home country but other large structures, such as the wing and cross beams, can be constructed elsewhere. 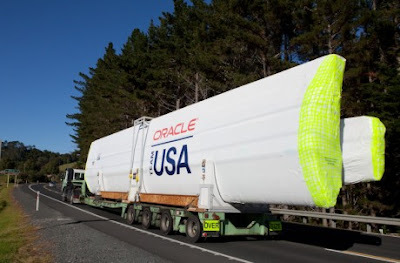 ORACLE TEAM USA is using its affiliate, Core Builders Composites, located in Warkworth, north of Auckland, New Zealand. Led by Tim Smyth and Mark Turner, this will be the fourth campaign that the team’s America’s Cup race boats have been built by CBC. The company has a worldwide reputation for innovative processes to create lightweight, high strength, reliable and accurate composite structures. Besides challenging weight and performance targets, CBC also had engineered and built the wing so that it complied with the AC72 class rule, which requires all wings to be quickly disassembled for cost-efficient shipping. “The wing construction is the result of 25,000 man hours work by CBC’s skilled workforce and was constructed over a period of six months,” said Smyth. 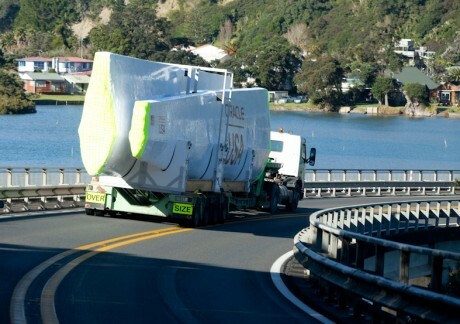 The wing will be trucked to Auckland and then shipped by sea to San Francisco, ready for final assembly with the hulls built on-site at ORACLE TEAM USA’s base in Pier 80. 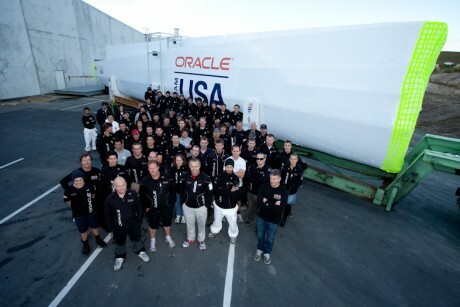 America’s Cup rules permit teams to launch their AC72s from July 1 onwards.